THIS ITEM WAS TRUE TO THE PICTURE SHOWN AND WAS ALSO BEAUTIFUL AND WELL REPRESENTED. I ALSO GOT IT AT A GOOD PRICE!!! THE PRODUCT ARRIVED ON TIME AND WAS PACKED VERY WELL. Spruce up any couch, bed or furniture item with this vintage 18 x 18, Blue White Jasmine Tree, linen throw pillow cover. Please note that this is the throw pillow cover only and does not include the pillow. Dimensions 18.0 In. X 18.0 In. If I could give it no stars I would. 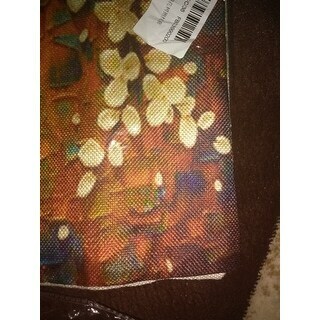 Ordered 2 of these cases, didn't realize that the flowers don't actually pop off the fabric, the color depicted in the picture is nothing like the sub par replica I received. This is false advertising imho. Now when I go to return them they want to charge me 11.69 for return shipping (they paid 2.92 to get it to me). And are only going to give me a partial refund.... this is the first and last time I ever make the mistake of ordering anything from Overstock. I'm thoroughly disappointed not only in the product, but also in the return process and lack of customer service. Don't waste your money!!!!! Appears to be good quality, great colors. 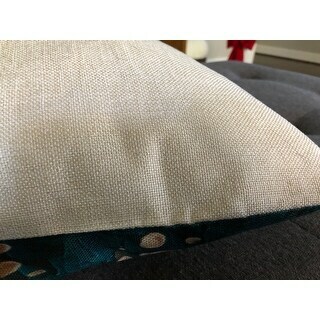 Again, the image appears slightly different than the actual pillow cover. 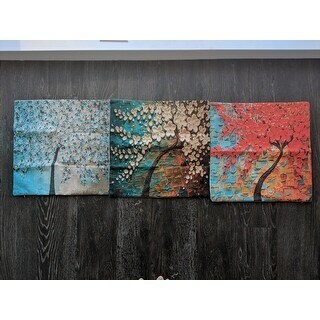 The picture makes it look like the flowers are raised off the pillow cover giving it a 3-dimensional appearance. This is not the case; however, the pillow cover is still very pretty! Love this series of linen pillow covers. I ended up buying 4 of them. They look good anywhere, and are not a run-of-the-mill ordinarily throw pillow. Beautiful. This pillow cover is as beautiful as pictured. 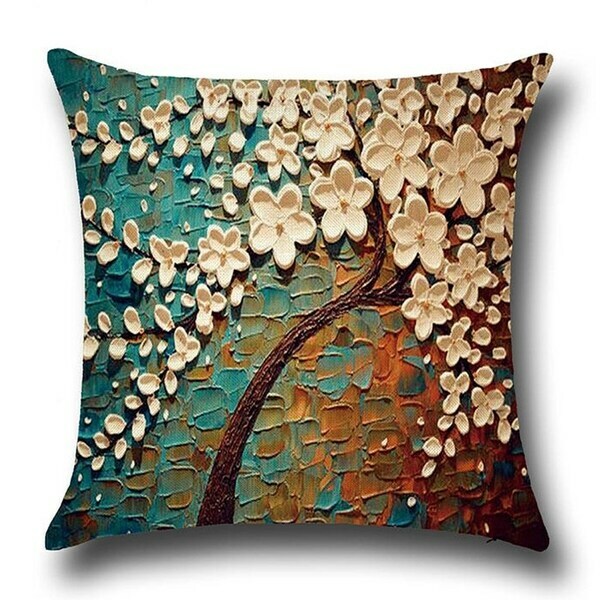 The picture of this beautiful throw pillow, looks 3D. It's not 3D but it's so well made, unless you are right on it, it has dimension. The colors are beautiful, teal, cream and orange make this the perfect fall decor accessory . I found that this throw pillow looks ok, nothing special. As with many of the other views, this would have been fantastic if the flowers were raised. If you just want a different look to the room, then this will work. If you are looking for a conversation piece, this is not it. The print was the most disappointing aspect. 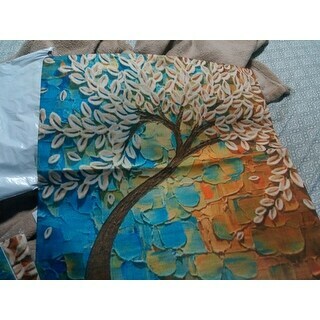 The image on the overstock site made it looks like the pillow print will look 3D-like. No, not for a moment did my eyes think that it could have been 3D because the resolution was low. 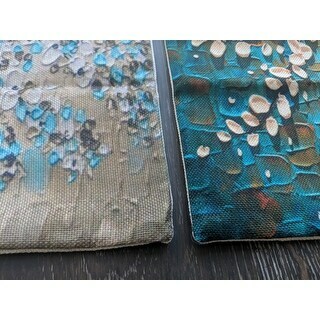 However, to be fair to the seller, these cushion cases do photograph well) see attached photos), the only thing they could have done to be more honest is to not increase the saturation of the images (which they obviously did when compared to the product photographed in filtered sunlight). To me, the fabric is scratchy and uncomfortable--it feels like a soft version of sizzle ropes one would use for cat scratching posts. Though my husband who has less sensitive skin thinks they are perfectly acceptable. 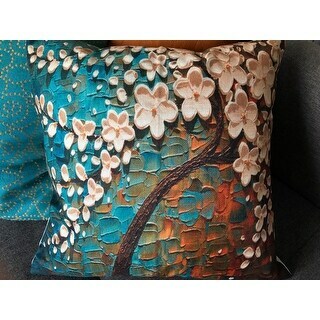 As most said, the product picture makes the pillow's print look less grainy than it actually is up close, but I never expected there to be flower adornments sewn into the pillow - it's obviously a print, not a high def photo. It still looks amazing for my purposes. Comfort-wise I'd say 3/5 - not intended to be a soft snuggle pillow (material is a medium-softness linen weave) but if you're looking for a beautiful print this is still right up there. Absolutely gorgeous! But I guess I should have read that it was only a pillow "cover", without a pillow inside. I was mad at first because it costs too much, in my opinion for just a cover. But I found a cheap pillow to stuff it and it was honestly too pretty and too much of a perfect fit for the look that I needed, to return. So I love it now that I found the perfect sized pillow to stuff with for cheap. Dimensions are not 18x18 as stated in the description. 17 1/4" x 17 1/8". The color combination was most appealing which is why I bough it. 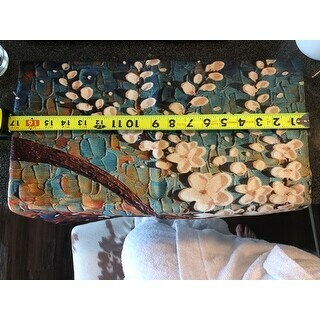 The fabric is linen and the image is not as 3D as it appears in the photo. There are no embellishments whatsoever and image is grainy. The backside is cream. I've bought a lot of home furnishing products online and I've come to realize that, just like facebook photos of your high school sweetheart, things don't always appear the same in person as they do on the computer. Did not like... it looks nothing like the picture on line, it wasn't worth the money.. I also thought they were the actual pillows I guess that's my fault..not worth it though. Nice looking. Would have been awesome if those flowers were 3-dimensional. That’s why 4 Stars. Material feel fine, not thin like others have said. It’s beautiful, and I recommend it. Pretty pillow cover looks great with the right collection. I would give 5 stars but they are not 18 by 18, they are 17 by 17. The product is only a cover for a pillow. Looking at the picture I expected two dimensional flowers on the pillow. Not worth the price. Again, the picture is quite misleading. 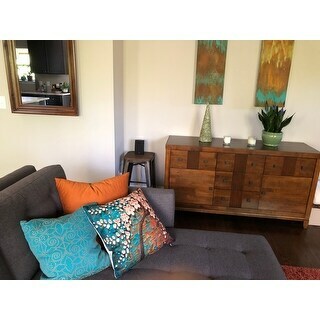 My couches are very neutral and so I was looking for a pillow with both color and texture. This has no texture. Those flowers are not appliquéd. I do love the design, just no ‘omph’. This item was way to expensive to simply be a printed pillow cover. I like the colors, looks nice as an accent pillow, not as fragile as it appears. As many of previous reviews I too expected a 3-D picture so that was a bit disappointing. The colors are as described and a beautiful pillow cover. I’m trying to update my living room and I have a perfect painting that will match.